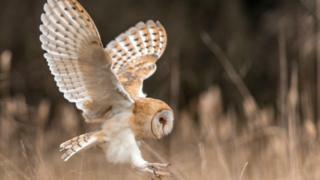 Barn owls keep their acute sense of hearing into old age, scientists have discovered. Previously, starlings have been found to have this ability, suggesting birds are protected from age-related hearing loss. Understanding more about the “ageless ears” of barn owls could help develop new treatments for human hearing problems. Birds are able to naturally repair damage to the inner ear. Georg Klump of the University of Oldenburg, Germany, a researcher on the study, said owls keep their hearing into very old age. It appears that humans lost these regenerative abilities at some point in evolution. Like all mammals, people commonly suffer from hearing loss in old age. By the age of 65, humans can expect to lose more than 30 dB in sensitivity at high frequencies. Commenting on the study, Dr Stefan Heller of Stanford University School of Medicine, said work was underway to investigate differences between birds and mammals. “To truly utilise this knowledge, we need to conduct comparative studies of birds and mammals that aim to find the differences in regenerative capacity, a topic that is actively pursued by a number of laboratories worldwide,” he said. The research, published in the journal, Royal Society Proceedings B, was carried out on seven captive barn owls. The birds were trained to fly to a perch to receive a food reward in response to sounds. Even the oldest owl, which reached the ripe old age of 23, showed no signs of age-related hearing loss. Barn owls typically only live to the age of three or four in the wild. The birds rely on their hearing to hunt prey at night.